According to the Telegraph/UK, Stockholm is “the startup capital of Europe” and the second most prolific tech hub per capita in the world after Silicon Valley. The Swedes themselves are highly wired, with 92% of the population online. Swedish tech sensations include Skype, SoundCloud, Mojang (maker of Minecraft), King (maker of Candy Crush), and the music service Spotify. Most recently, the startup tech company Resolution Games scored 6 million dollars’ worth of investment capital between May and August of 2015. Sweden was ranked among the top ten globally competitive economies according to World Economic Forum, and boasts a long history of innovation: in addition to mega-design-store IKEA, we can thank the Swedes for zippers, three-point seatbelts, and diagnostic ultrasound technology. With so much innovation at hand, Sweden is a good place to do business. At an event organized by the Philadelphia Swedish-American Chamber of Commerce at the University of Pennsylvania, reporter Klas Bergman presented some tips for Americans doing business in Sweden. According to Bergman, Swedish business culture reflects the values of Swedes in general. Most notable is the emphasis on egalitarianism and collective decision-making. Organizations tend to be flat rather than hierarchical, and decisions are made collectively, from the bottom up. All team members have a voice in the process. Americans doing business in Sweden must be willing to engage in deliberation and debate. Interruptions, displays of emotion, or “power plays” will not be appreciated. The egalitarian Swedish perspective requires a more polite, less aggressive approach. Swedish cultural values are also highly egalitarian with respect to gender. Women hold positions of power and are treated no differently than men in a business setting. In fact, Sweden has the second-highest proportion worldwide of women in government leadership positions. 52% of Swedish government ministers are female. Sexist jokes are not appreciated. Swedes also express egalitarianism in the routine use of first names. However, do not assume that using first names invites familiarity. Swedes prefer to keep their private lives separate from their work lives. Although Swedish work-life policies are famously generous to family life, with paid paternity leave and ample vacation time, Swedes may themselves seem reserved and reticent to answer personal questions about family. Other topics to avoid include divisive political issues. For example, immigration in Sweden has become a political problem, and attempts by foreigners to introduce the topic may cause embarrassment. 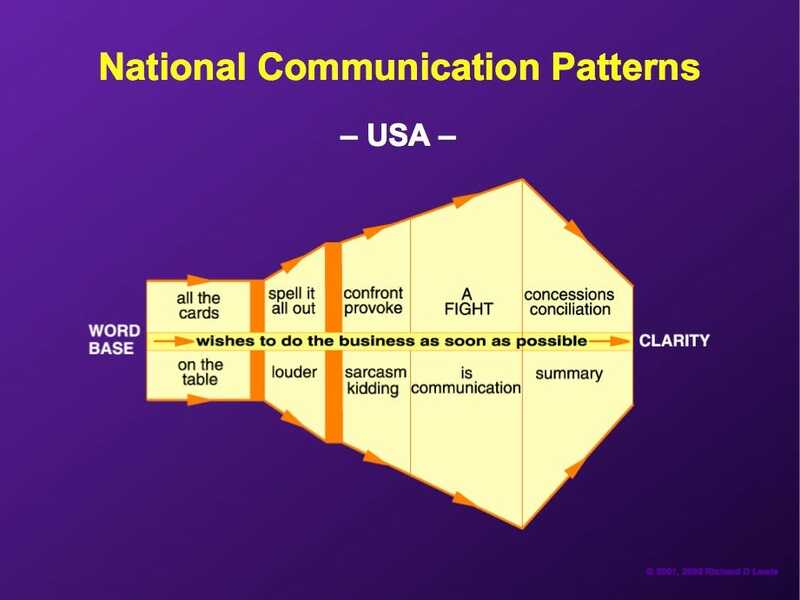 According to diagrams developed by Richard D. Lewis in his book When Cultures Collide, the typical US negotiation pattern could not be less suitable for use in Swedish business contexts. Lewis demonstrates that there is a great deal of talk and deliberation during Swedish negotiations, but he points out that discussion is measured, deliberate, and carefully worded. This contrasts strongly with the US use of provocation, humor, and sarcasm as depicted in the typical US negotiation pattern. Americans must be careful of their words, because in Sweden, verbal agreements are considered binding. Although a contract or agreement may not have been drawn up yet, one must never agree to something in jest or with the intention of modifying the position later. An important key to understanding the Swedish preference for egalitarianism and group deliberation at work is the public’s attitude toward government services and supports. Bergman noted that 53% of GDP is consumed by the Swedish government, compared to the 37% of US GDP consumed by the US government. In his presentation, Bergman emphasized that Swedes in general have faith in their government and believe in the institutions that exist to represent their needs. In his presentation of rankings of perceived public sector corruption, Bergman noted that 37% of Americans consider the US Government corrupt, while only 14% of Swedes believe that the Swedish Government is corrupt. This more widespread faith in the social compact, according to Bergman, spills over into the Swedish way of collaboration and innovation, encouraging a more collective approach to decision-making. It is a mistake to “paint with a broad brush” and stereotype individuals according to generalizations about their culture. 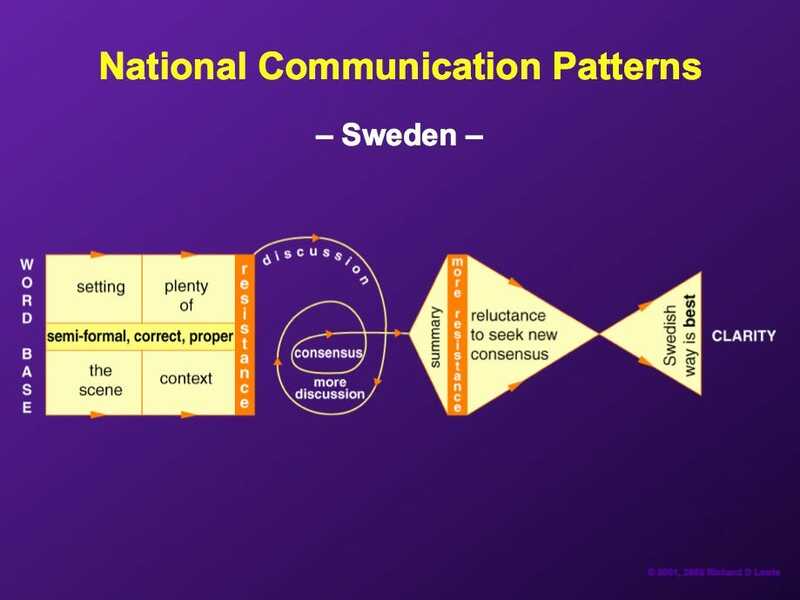 However, learning about Swedish business culture will improve your chances of communicating clearly and successfully. MTM LinguaSoft provides cross-cultural training and consulting services to help businesses build the skills that are necessary for success in global business.